As the No. 1 prescribed brand of full-contour zirconia in North America, BruxZir® is the strongest all ceramic restoration available on the market. Approved for anterior and posterior prostheses alike, BruxZir is consistently shaded to prevent white spots caused by chairside adjustments. Adjustments and polishing: Adjust BruxZir zirconia crowns and bridges using water and air spray to keep the restoration cool and to avoid micro-fractures with a fine grit diamond. If using air only, use the lightest touch possible when making adjustments. A football shaped bur is the most effective for occlusal and lingual surfaces (on anterior teeth); a tapered bur is the ideal choice for buccal and lingual surfaces. Polish BruxZir restorations with the porcelain polishing system of your choice. Adjust zirconia crowns and bridges using water and air spray to keep the restoration cool and to avoid micro-fractures with a fine grit diamond. If using air only, use the lightest touch possible when making adjustments. A football shaped bur is the most effective for occlusal and lingual surfaces (on anterior teeth); a tapered bur is the ideal choice for buccal and lingual surfaces. 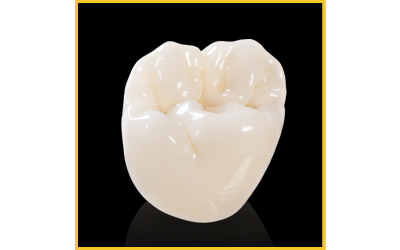 Polish solid zirconia restorations with the porcelain polishing system of your choice.